Songbird Prairie received two awards yesterday at the R.O.S.E. Awards Banquet held at the Allure Banquet Center in Laporte. The first was "Hotel of the Year", which is recognition of service excellence. Songbird Prairie has won this prestigious award 3 times in the last 12 years since they first started the yearly R.O.S.E. Awards. We at Songbird Prairie strive to give every guest the personal service they deserve, while respecting their privacy during their stay as guests in our home. Fireplaces, Whirlpools, fine linen, and our three course hot breakfast are sure to please even the most discriminating guest. As on site Innkeepers we offer personal concierge service by providing maps and local information to restaurants and attractions. Our 6 1/2 acres backs up to 450 acres of woodland, meadow and farmland. You can hear the moo of an occasional cow through our microphones in the sunroom. One guest wrote in the journal, I think I heard a cow bird? No that was a real cow! Porter County offers travelers many unique attractions. The Indiana Dunes National Lakeshore is on the coast of the fifth largest freshwater lake in the world! Beyond the Beach you will discover sites where the rare Karner blue butterflies floats among wild lupine blossoms to ten thousand sandhill cranes gathered during fall migration. From quaint chef owned restaurants to Arboretums and wildlife sanctuaries, Beyond the beach trail is designed for several days of adventure. Come to visit Nature's Masterpiece at the Indiana Dunes and stay at Songbird Prairie where you will "fall in love with nature"
Come out to see a fireball of citrus orange and black, the Baltimore oriole next to the breathtaking tropical blue of the male Indigo Bunting? Look no further, come to northwest Indiana to Songbird Prairie Bed and Breakfast and as you enjoy your three course hot breakfast, you will see the colorful birds serenade and entertain you. Here's what a guest had to say about breakfast! The male indigo bunting is so breathtaking with its tropical blue and silvery bill. The females and immatures are a warm cocoa brown overall. This bunting has a habit of twitching its tail to the side, and its spit note is characteristic. Males change their blue feathers for brown in autumn, which makes for some interestingly mottled specimens. They molt again on the wintering grounds in Central and northern South America and return in spring, blue once more. This species is common on roadsides and disturbed areas there “trashy” vegetation flourishes. Power lines cuts, old fields, landfills, railroads, and hedgerows ring with the songs of indigo buntings, especially as summer reaches its fullest. That is where you will find them right here at Songbird Prairie Bed and Breakfast.The indigo bunting takes insects when they are available, especially to feed its nestlings. Weed seeds are its mainstay, and thistle from the feeders, supplemented by berries and small fruits. It forages on or near the ground, as well as in low shrubs and trees. Watch for them in autumn, bending grass stems and flickering their tails side to side as they forage in weedy patches here at Songbird Prairie Bed and Breakfast. Indigo buntings have a rather loose definition of monogamy, with extra pair copulations being frequent. Males visit females in neighboring territories, and females visit males. Males vary in their tendency to feed young. Some are attentive parents where as other leave most of the chick rearing to their mates. The nest is bulky but compact, cup-shaped and constructed of bark strips, grasses and weed stems and skeletonized leaves, all bound with spider webs. It’s often low in blackberry, sumac or other brushy vegetation. These birds nest quite late in the season, reflecting their dependence on late maturing weed seeds. Three to four eggs are incubated by the female for about 12 days, and the young leave the nest 8-14 days later. Early in the spring you may see them feasting on dandelion seeds. Later, black oil sunflower seeds and millet mixed prove attractive. They love coneflower, Mexican hat, cosmos, coreopsis and especially foxtail grasses. 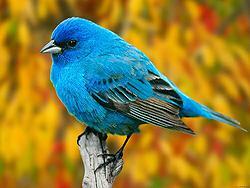 Come and enjoy the beauty of the indigo bunting here at Songbird Prairie Bed and Breakfast. Visit Songbird Prairie and have breakfast watching the orioles drink nectar from oranges and eat grape jelly! The Baltimore oriole is perhaps the most famous neotropical migratory bird. Its brilliant orange and black plumage is reminiscent of the crest of Lord Baltimore, an important figure in Maryland's history, and the bird has become the mascot of the Baltimore Orioles baseball team. Oroile's journey begins in the tropics, from Mexico to northern South America, where Baltimore orioles spend most of the year. Here they inhabit lush, tropical forests and feed on nectar, pollen, fruit, and insects. They especially favor coffee and cacao (the plant that chocolate comes from) plantations where these crops are grown in the traditional manner, the coffee and cacao shrubs flourishing under a shady canopy of natural forest trees. Pairs of males and females form flocks of about 10 individuals, although sometimes as many as 30 or 40 are in a single flock. Baltimore orioles are often the most common migratory bird in these agricultural forests except for maybe the warbler family. The birds favor the tops of trees, especially those in the genus Inga, where they forage among the numerous blossoms for nectar and pollen. Orioles have a special tongue, which resembles a brush, for lapping up nectar. Shade grown coffee plantation, winter habitat of the Baltimore oriole. By April, most Baltimore orioles have begun the journey north to their breeding grounds in North America, which span most of the eastern United States and into southern Canada. Here they eschew the dense forests that so many other migratory birds favor, instead preferring open forests such as those along rivers and even in city parks. Their nests are unmistakeable in that females build an unusual grassy hanging nest that is suspended like a sack from the end of a branch. The shape of the nest may help deter predators from eating the eggs or young because the eggs and young are hidden from view and the entrance to the nest is difficult to access. The nest is often built in an elm, sycamore, or cottonwood tree. In the video clip below you can see a nest. Because these orioles spend much of their time in the tops of trees, they are often heard before they are seen. The male has a lovely warbling song and both males and females utter a variety of chatters and short call notes. The female lays 4 to 5 eggs in late spring or early summer and incubates them alone. Then, both the male and the female feed the young. Pairs make only one nesting attempt per year. And by August or early September, most orioles are on their way back to the neotropics. Sometimes orioles can be enticed to visit our backyards. Orioles sometimes visit feeders put out for hummingbirds, and are also attracted to fruit such as bananas and oranges. Visit Songbird Prairie to view these beauties!